OS X El Capitan introduced a number of Safari improvements, including the ability to pin your favorite websites. Pinning a website puts the site's icon in the top left section of the Tab bar, allowing you to easily pull up the website with just a click. Websites you pin in Safari are live; that is, the page is constantly being refreshed in the background. Switching to a pinned site presents the most current content available, and since it has already been loaded, the site is instantly available. Site pinning only works on the tab bar. If you don't have the tab bar visible, pinning won't work. From the View menu, select Show Tab Bar. With the tab bar now visible, you’re ready to pin a website. Navigate to one of your favorite websites, such as About: Macs. Right-click or control-click the tab bar, and select Pin Tab from the pop-up menu that appears. The current website will be added to the pinned list, which is located at the far left edge of the tab bar. Make sure the tab bar is visible. Right-click or command-click in the pin for the website you wish to remove. Select Unpin Tab from the pop-up menu. Interestingly enough, you can also select Close Tab from the same pop-up menu, and the pinned website will be removed. As you may have noticed, pinned websites appear to be nothing more than tabs that have been collapsed to a small site icon. They do have a few extra capabilities missing from plain tabs. The first of these we have already mentioned; they're always being refreshed in the background, assuring you'll see the most up-to-date content when you open a pinned website. These are a part of Safari and not the current window. This allows you to open additional Safari windows, and each window will have the same group of pinned sites ready for you to access. Pinned websites will likely prove very useful for those who make use of websites with content that is constantly changing, such as web-based mail services, and social media sites, such as Facebook, Twitter, and Pinterest. 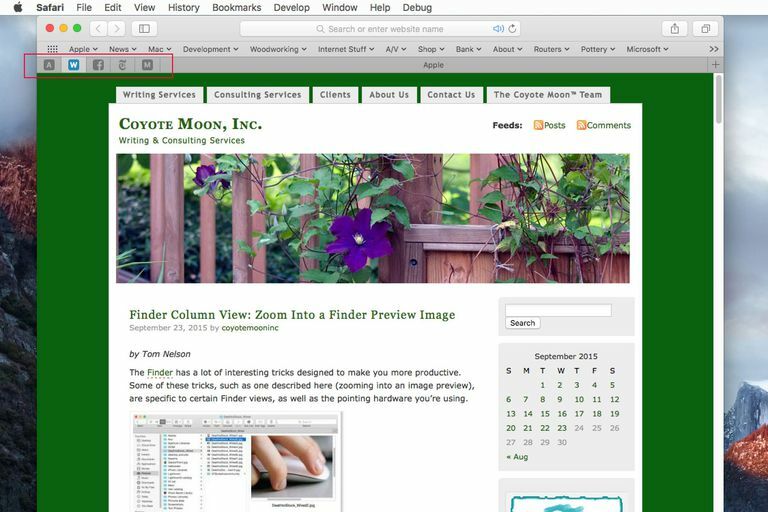 When you select a pinned website, it should have its title displayed in the tab bar; instead, the last non-pinned website that was open, or the default home page, has its title displayed, although the website isn't visible. The pins themselves can become quite small; this is especially true for anyone with a Retina-equipped Mac. If you get carried away with pinning websites, you can use up enough space on the tab bar to make using normal tabs frustrating. Pinned websites deserve their own place in the Safari UI, and should not be sharing the tab bar. There's the potential for pinned websites to be a resource hog since they're all actively being updated in the background. This shouldn't be an issue unless you happen to pin a large number of websites that are very active and always updating information.